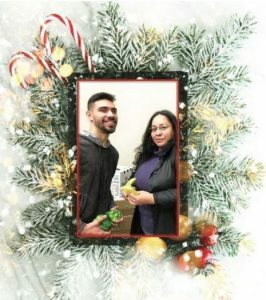 We are the Tovar’s and this is our story about life changes that made us realize the importance of resources like the Aurora Area Interfaith Food Pantry. My name is Tiffany and I wanted to tell you how Aurora Food Pantry has helped my family and so many others. I’ve been coming to the pantry for about four years. I have three great kids: Anthony is 17, Christian is 13 and Ivy just turned 10. I work, but groceries are getting expensive – especially with two teenage boys! Even still, I only come for food when I absolutely need it. I also volunteer at the pantry because I want to pay back what you have given me. Anthony did his high school service hours at the pantry, too. It’s so important to give back. Every is so friendly when we come to shop. The volunteers know you by name and they make my kids feel special. I really like that it’s like a grocery store because it means you can get what you need and you have a choice. 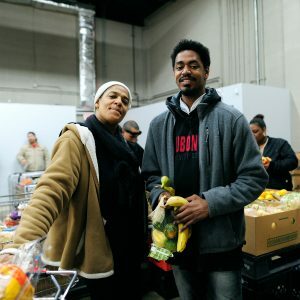 We’re so lucky to have a place like Aurora Food Pantry – you don’t feel so bad that you don’t have as much as other people. When I volunteer, I see how many families are helped and how much it is appreciated. This food really helps a lot of people. Thank you! Learn how you can give back by becoming a volunteer. Nadia, like so many of our clients, never thought she would be hungry. Food pantries were for “other people.” She had a good job, a college education, house, and family – with two sons enrolled in college. Donate today to help families like Nadia’s. Robert was a volunteer and donor at Aurora Area Interfaith Food Pantry. Following a stoke and a long rehabilitation that kept him from working, Robert began to visit the Pantry to supplement his food supply. This is where most of these stories end. But for Robert, it was just the beginning. Despite his own health issues, Robert looked after his struggling elderly neighbors, Victor and Maria, and their adult son with physical disabilities. 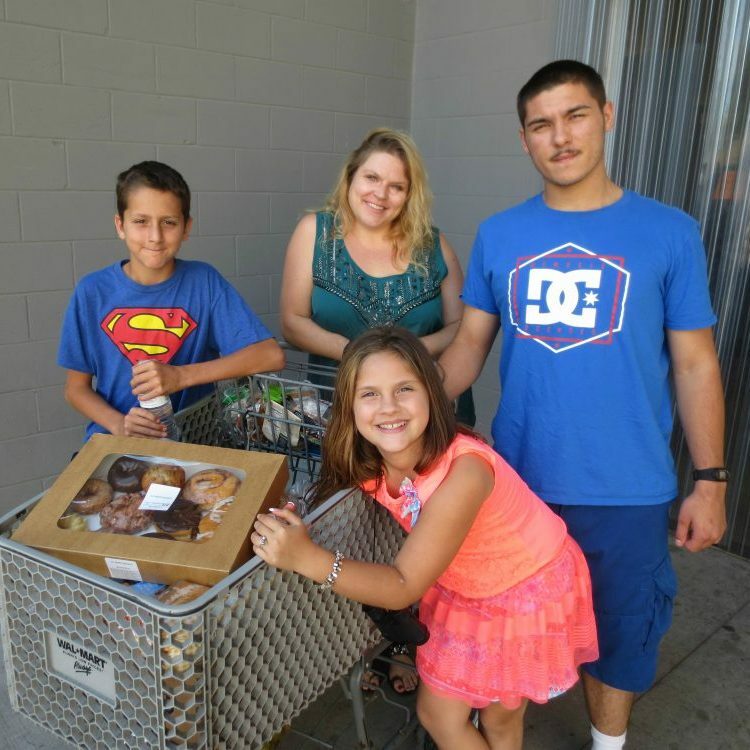 Robert took the food he received from Aurora Food Pantry to put together a home cooked feast, complete with a beef roast, baked chicken, vegetables, and a sweet surprise: a made-from-scratch blueberry pie, baked with the fresh blueberries Robert received at Aurora Food Pantry. 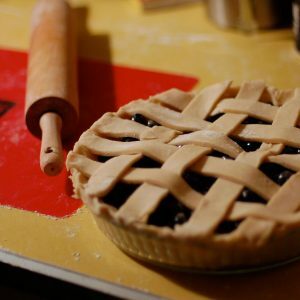 Get Robert’s blueberry pie recipe here. Food, electricity, medicine – pick one. Clients like Maria are all too often forced to make these impossible decisions. Maria began coming to Aurora Food Pantry to help feed her family. The food she received freed up money for bills and other necessities. 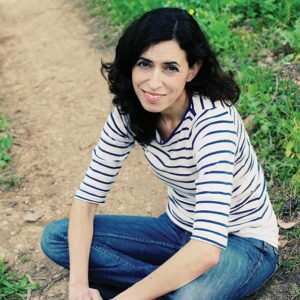 But in 2011, life changed when her son Joshua was diagnosed with ALS (also known as Lou Gehrig’s disease). The average age for an ALS diagnosis is 55; Joshua was 15. Today, Joshua is 21 and, despite having good days and bad days with his disease, he is a cheerful and positive young man, with an amazing talent for mechanics. When shopping at the pantry alongside his mom, Joshua picks out soft foods like oatmeal, enriched noodles, and bread that are easier for him to eat. Find out what food items are most in need at the pantry. The benefits of volunteering are well-known: you have a positive impact on your community while engaging with new people. 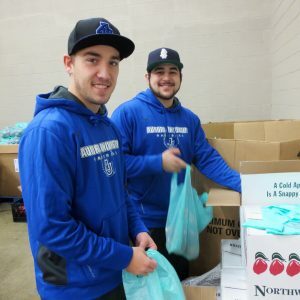 Volunteering also promotes teamwork and communication, two skills that are demonstrated by the student-athletes at Aurora University. In January 2014, just two months after moving into our current building, the AU Athletic Department began coordinating their many sports teams to volunteer at the pantry. Each of our three weekly distributions requires 35 volunteers to help stock and distribute food, so the need for volunteers is great. AU student-athletes assist with all aspects of distribution, including helping clients, stocking, cleaning, and working in the parking lot. Their hard work and dedication has added up to thousands of volunteer hours since 2014. We are so grateful to these young adults who have made such an amazing impact on our clients and community. Thank you – and go Spartans! Many of the people who come to the Pantry for food are employed, but it still may not be enough to make ends meet. Irma is one of those people. After coming to the Pantry with his mother, Irma’s son, Chris, who has cerebral palsy, began volunteering twice a week to give back for the help they received. And he continues to volunteer to this day. Irma and Chris’ story is not unusual. Throughout our community, hunger affects people of all ages and all walks of life.